I got this clock for Christmas from a family member. It helps me get up in the moring, and all the technology is great. The Ceiling Projection of the time is the best part of the clock, and the Atomic aspect is very easy to keep the correct time. It's an alarm clock that sets itself via radio waves from the atomic clock in Boulder, Colorado. It has time projection ability and even tells the weather. With the Oregon Scientific ExactSet Projection Alarm Clock you can keep your pretty little head on the pillow in the morning. Just tap the snooze button & the clock will momentarily project the time on the wall or ceiling in soft red light. You can even rotate the projector forward 90 degrees if needed. And being an ExactSet clock, it automatically sets it's own time, day, & date. It automatically connects to the atomic clock 6 times a day via it's built-in radio receiver. It even adjusts for Daylight Savings Time & Leap Year. 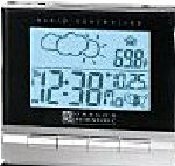 displays the weather forecast, indoor and outdoor temperatures via LCD or Projector. It includes an AC adapter that will continually project the time throughout the night. It's surely my favorite clock.